April is the month of the Military Child. The Mums and Dads that serve in our Armed Forces get all different types of recognition and reward; promotion, medals and praise from their Major or Colonel, but our children who wave goodbye and stay brave through months of separation often get overlooked. We love the month of April because it reminds us to focus on how amazing our children are and take some time to sit down and talk about how they feel about Mummy or Daddy being in the Armed Forces. Little Troopers was set up to help military children and families keep the bond despite months apart. We work with teachers, military welfare offices and families directly and have a wealth of resources to help our military families. You can download one of our certificates to show your children that they are amazing, get them their very own medal or use our parents resources for ideas to help during deployment. 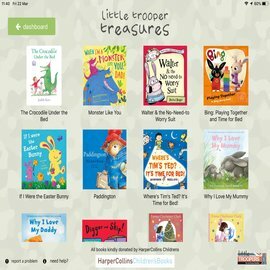 One of our most popular resources is the Little Troopers Treasure app. The app allows parents to be involved in the bedtime story even if they are miles apart. Find out more here.